After scoring After scoring a goal and assisting on two others in the first two periods of play, Evgeni Malkin left early in the third period of Saturday’s game in Detroit with a lower-body injury. With the Penguins on a power play, Malkin got tangled up with Luke Glendening while trying to prevent the Wings forward from getting a shorthanded breakaway and went hard into the back boards. The Penguins center stayed down on the ice and was attended to by trainers. While he was eventually able to get up, Malkin did not put any weight on his left leg as he was helped off the ice by teammates. Though Malkin was seen walking in the locker room after the game, Penguins head coach Dan Bylsma said he needs to get further evaluated on Sunday. So does defenseman Kris Letang, who was a game-time decision going into the contest and was scratched with an upper-body injury. But despite all of the injuries and absences the Pens are dealing with right now, they produced a much more complete effort than they did 24 hours early against New Jersey and were rewarded with an emphatic 4-1 win over the Red Wings at Joe Louis Arena. Sidney Crosby scored twice while Olli Maatta and Malkin had Pittsburgh’s other goals. Goalie Jeff Zatkoff, playing in his native Michigan for the first time, made 28 saves to get the W.
With Letang scratched, the Pens played Saturday’s game without any of their top-four defensemen. His absence meant that Brian Dumoulin – recalled from Wilkes-Barre/Scranton on Monday – made his NHL debut. Dumoulin admitted he definitely got a lot more ice time and responsibility than he was expecting after the Pens were forced to rotate a youthful group of five – including sophomores Robert Bortuzzo and Simon Despres and fellow rookie Maatta – for just over two periods after Deryk Engelland received a match penalty for his hit on Justin Abdelkader with 30 seconds left in the first. Engelland was ordered to the dressing room immediately as a match penalty involves the suspension of a player for the balance of the game, per the NHL rulebook. But just as they have done all season, the Pens didn’t just try to tread water in a tough situation – they started swimming laps (or something like that. To put it simpler, they were excellent). The game only got tougher in those final 40 minutes, with a long kill to start it off and the Wings pressing with all of their might to try and get back in the game in the third. But that group of five held Detroit off the scoreboard and to just three total shots in the third. The most experienced NHLer of that group, Matt Niskanen, stepped up to lead all skaters with 29:26 minutes. He was constantly going over the boards in both matchup situations and for special teams, as Niskanen slotted in on both the top power-play unit and the penalty kill – where he logged a team-leading 6:02 shorthanded minutes. Dumoulin may not have been expecting to play as much as he did (18:10 minutes), but he said going over the boards more often helped him get into a rhythm. Behind those defensemen, Jeff Zatkoff produced a terrific performance. The Michigan native made 28 saves to win his first-ever game in the arena he grew up playing in and visited most recently with his college team Miami (Ohio) a few years ago. A lot of those tests came on Detroit’s five power-play opportunities, including Engelland’s five-minute match penalty to essentially start the second. The Red Wings kept throwing pucks to the net and sieging his crease, creating lots of confusion and havoc, but Zatkoff calmly weathered every storm and was a big reason Pittsburgh’s penalty kill was perfect tonight. It looked like he was seeing every puck and was somehow getting body parts on shots that sneaked through traffic. “Their power play was a shooting power play and they built those shots up in the first period,” Bylsma said. “We saw that and he got tested again. He came up strong the second period. I think he was probably our best penalty killer through that five-minute stretch. Had several big saves. Was really strong around his crease. The two-headed monster was too much for Detroit’s penalty kill. After Detroit took a 1-0 lead on a goal from Niklas Kronwall, Crosby and Malkin each scored on the power play to give the Pens a lead they wouldn’t relinquish. The Pens’ top unit has had to adjust to a lot of absences recently. They lost Paul Martin (broken tibia), James Neal (suspension) and then Letang (upper-body) this evening. But the guys who slotted in with Crosby, Malkin and Chris Kunitz tonight – Jussi Jokinen and Matt Niskanen – helped the Pens quickly convert both of their first-period chances. Jokinen earned the primary assists on both goals, starting with Crosby’s. The play started when Malkin hit the captain with a pass from the center point. 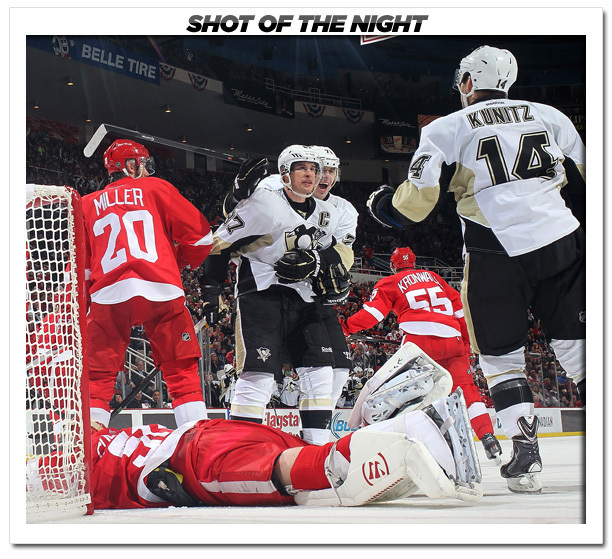 Crosby took a shot from the circle and followed it to the net, where Jokinen got him the rebound. Crosby moved it to his forehand and tucked it into the open cage. Jokinen then began the sequence for Malkin’s goal when Gustavsson allowed a juicy rebound on his shot from the corner. It went right to Malkin at the top of the crease, who tapped it in for his 600th career NHL point. After the game, Engelland explained what happened on the hit that injured Abdelkader.